Please read the start of part 1 to find out how you can try out these features too! OK so part 2 is about in-browser video transcoding. So…what does all that jargon mean and why should you care? Just as image files come in different formats (BMP vs JPG vs TIFF vs PNG vs SVG vs …), so too do videos. In fact it’s rather more complicated because there’s these things called codecs. As far as I understand it, different codecs are different methods of compressing audio/video – codes that say how to pack the raw (and huge) audio/video file in a particular way to save space. But because each codec has its own particular way, you need to unpack it in that same particular way otherwise your computer won’t be able to understand it, and you won’t be able to play the file. MP3 is an audio codec. MPEG-2/3/4 are video codecs. Unfortunately it’s not even as simple as equating file format == codec, because some file formats are “container formats”. AVI and OGG are container formats, and it means that inside, the audio/video can be encoded in a variety of different codecs. So basically it’s more pain. An essential part of the Wikimedia Foundation’s mission is encouraging the development of free-content educational resources that may be created, used, and reused by the entire human community. We believe that this mission requires thriving open formats and open standards on the web to allow the creation of content not subject to restrictions on creation, use, and reuse. Patent-encumbered file formats like MP3, AAC, WMA, MPEG, AVI and the like are not accepted at Wikimedia Commons. Our mission requires content to be freely redistributable to all. Patent-encumbered formats fail to meet this standard. Well, soon things are going to get a whole lot better: with Firefox 3.1, due next month in February, by default Firefox will support Ogg Theora. That means you’ll be able to play Ogg video in your browser without any extra software. But even better: someone has written an extension called Firefogg which will transcode a file for you when you upload it. 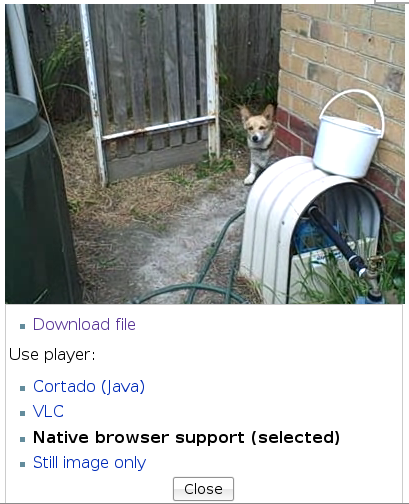 So, if you have Firefox 3.1+, and you have the Firefogg extension, and you come to a site that only accepts Ogg and you have a something-else file, now you just need to upload it as normal and Firefogg will convert the file for you before uploading it to the site. … then we can choose some random video format (in this case, AVI). And instead of just uploading, it will do transcoding (converting the format) and then uploading. And… wala! Here’s my uploaded file, now in Ogg format, and playing using just the browser because that’s how awesome Firefox 3.1 is going to be. As it transcodes, it also writes a copy of the final Ogg file next to your original file – handy to have both around. Go and upload videos with the greatest of ease! Again this is something I hope that will become available as a Gadget for people’s user preferences, so if you like to experiment a bit please do so and report back, so it can be stable enough by the time Firefox 3.1 is released to be a Gadget for everyone. It all began (publicly) with a press release, mid-January. No, wait. The average Wikimedian would first have had the opportunity to hear of it via a Wikinews ‘leak’. That was about a week beforehand. A few days after the press release, Jay Walsh had what must have been a baptism of fire in making the announcement to the community. Free file formats: Kaltura is essentially a Flash thingy at heart. Gnash was talked up in response. Commercial advantage: It is no surprise to anyone in Wikimedia that Wikimedians are edgy about advertising. This extends to anything that looks like undue commercial advantage. Kaltura is not what you would call subtle. Everything they do is Kaltura-branded and screams “FLASHY WEB2.0 THINGY”. Their whole aesthetic is quite antithetical to ours. It is offensive to a Wikipedian’s eye. There are similar alternatives which are more acceptable in this sense. In the future I hope the Foundation will first seek community input on technology partnerships: A flash slideshow editor isn’t anything anyone here has been asking for, as far as I can tell… But we have thousands of other widely desired features, many of which could have substantial external components ripe for partnership. Kaltura would only be implemented on Wikimedia sites when it was completely free (ie, Gnash works). This partnership is non-exclusive, ie doesn’t preclude any others being made with similar partners. As for lack of clear benefit, all we are doing is lending our name – at this stage not even dev resources. If lending our name leads to cool stuff becoming open source, what’s to lose? This comment and similar sentiments perhaps prompted Florence, the Board chair, to post a draft resolution on a File formats policy. It has not yet been posted publicly as a passed resolution. In the end, everyone seems content enough with where we all stand, but really, we went through some serious drama to get there. Drama started by others (like, journalists) is one thing, but I don’t think it should be quite so difficult to spot which of WMF’s own announcements are going to be the fire starters. So there you go, that’s my view of the Kaltura brouhaha.